River Ottery. | Launceston Then! 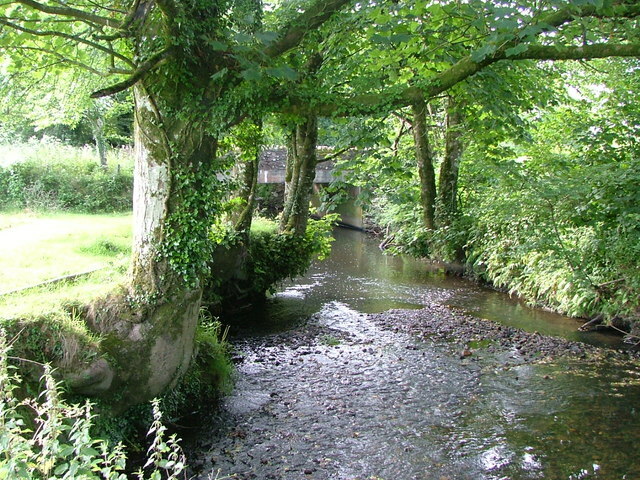 The river is about twenty miles long from its source southeast of Otterham to its confluence with the River Tamar at Ham Mill, two miles northeast of Launceston. The headwaters of the River Ottery are within the civil parish of Otterham but formerly came under the parish of Forrabury and Minster. 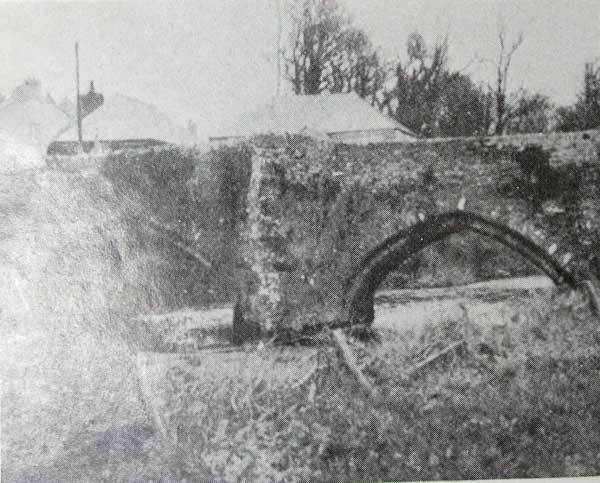 In 1311, the rector of that parish wrote: ..the river Ottery takes its rise in this parish and flows to Canworthy Water and so by Yeolmbridge to the river Tamar. 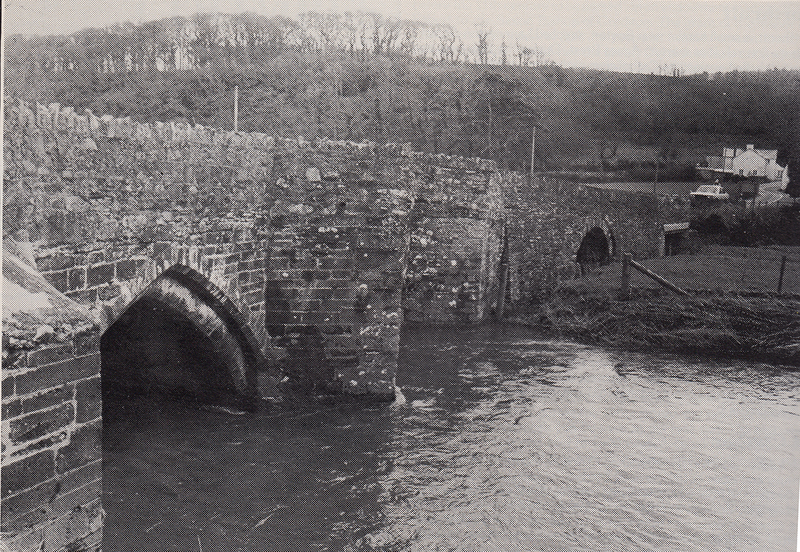 It has often been called the ‘Attery’ and this pronunciation dates back to 1535 and Leland who wrote it as ‘Aterey.’ He described his journey to Launceston “After that I had enterid a little into the suburbe of Launstoun, I passed over a brooke caullid Aterey that rennith yn the botom of the stepe hil that Launstoun stondith on. . . . After that I had passed over Aterey, I went up by the hille thorough the long suburbe ontylle I cam to the toun waul and gate, and so passid through the toun, conscending the hill ontylle I cam to the very top of it, wher the marketplace and the paroche chirch of S. Stephane, lately re-edified, be.” In his 1880 book ‘Launceston Past and Present,’ Sir Alfred Robbins wrote ““It is not without a pang that Arthur is thus sacrificed upon the altar of modern criticism, and one clings to the hope that the romance that enwraps him has grown only like that of Roland of Roncesvalles, and that just as there is a basis in fact for the great “Chanson” so there is for the Arthurian tradition. With its tributaries, the River Ottery forms a major sub-catchment of the Tamar system, draining 48 square miles (120 km2) of north Cornwall. The River Ottery’s catchment area is within the Carboniferous geological formation known as the Culm Measures which stretches from Dartmoor to north Devon and across northeast Cornwall as far west as Bodmin Moor. The infant river initially flows north until it reaches the hamlet of Trengune. From here it adopts an east-southeasterly course through to Canworthy Water. In September, 1489, the Court of the Hundred of East assembled at Carneworthy Bridge, perhaps to mark the extreme North-Easterly point of its jurisdiction. It was at this point that the Ottery took over the County boundary and carried it to its confluence with the River Tamar (until the boundary changes of the mid 1960’s). Legend has it that the Commissioners who fixed the the bounds between Cornwall and Devon were entertained at Werrington Park with such great cheer that they went on their way staggering up the Ottery, being fully convinced that they were following the Tamar. The place names up the river valley, however, incline one to think that the stream was once a real national frontier. On the Northern bank, Anglo Saxon names contrast in a marked degree with the Tre’s and Pen’s on the South. From Canworthy Water the river winds its way below the estate of Penheale Manor, edging around North Petherwin towards Hellescott Bridge. A further two miles and it reaches Yeolmbridge and then snakes its way through Werrington Park where at Ham Mill it finally reaches the River Tamar. 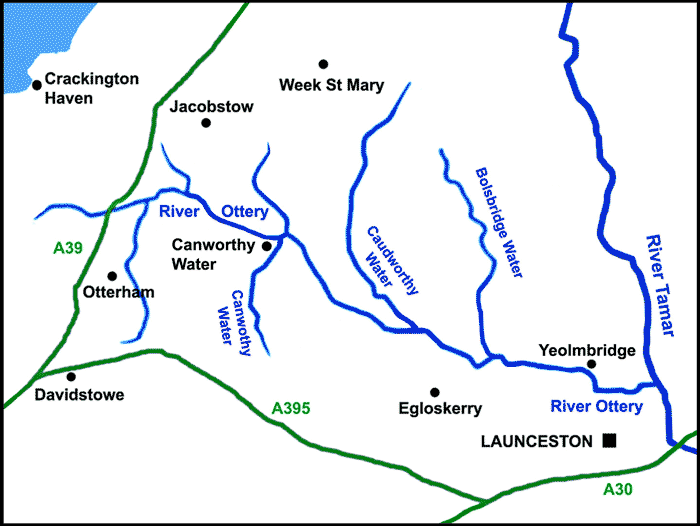 The River Ottery system was severely affected by flooding in north Cornwall on 16 August 2004 when up to eight inches of rain fell during a single afternoon.The Ottery headwaters at Marshgate and Otterham were the most severely affected. The river flows through an isolated area of mixed farming and the only riverside settlements of any size are Canworthy Water and Yeolmbridge (below).